This is a solar geyser. Simple really…the sun heats the water in the pipes and transfers it back to the holding tank. Then , when you want hot water, you turn on the tap and voila! You have probably seen these all over South Africa , especially in low cost housing areas as they are a very cost effective method of providing hot water where there is no electricity infrastructure.As an energy saving product, Solar Geysers are particularly effective as there is no electrical cost to start with – they don’t need any electrical connections at all. 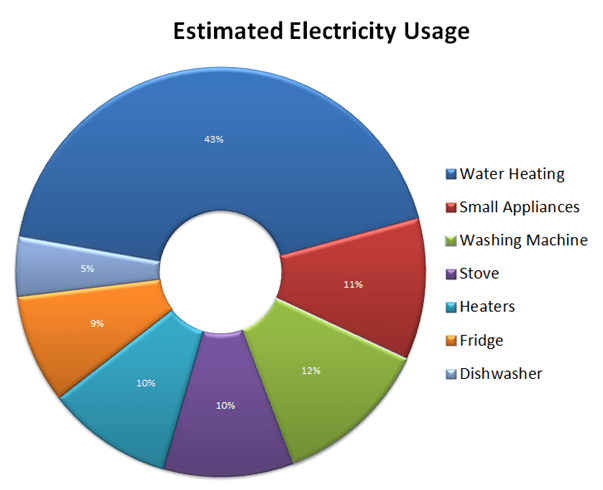 As you can see from this diagram,water heating accounts for most of the electricity use in a home. With our abundance of sunshine in South Africa , the solar geyser is an attractive option for homeowners and business owners looking to effectively reduce their power consumption. The Solar geyser – how it works. This is the basic concept of the solar geyser..Cold water from the house is fed through the collectors ( the pipes that you see on the frame) and it is heated by the sun. It then creates a flow of water to and from the tank. As the natural laws of heat and cold apply, the hot water rises to the top of the tank and the cold water sinks to the bottom. The outlet tap is positioned on the top of the tank and this ensures that hot water is always on tap. The real benefits of a Solar Geyser. Solar is free hot water. A solar system increases the value of your property. A solar Geyser is the only appliances that save you money. Generate FREE, clean energy while preserving the environment. Electricity increases of 15% year on year, start saving from day 1. Warm water accounts for up to 40% of your electricity bill. At Saving Energy , we only work with specialists in their fields to ensure the best and most accurate information as well as highly qualified personnel to do the installations. We have partnered up with Solar ZA for our solar geysers and they specialise in the solar geyser systems you can see on this page. They are offering their expertise for anyone that wants to investigate the option of a solar geyser system. You can simply fill in this form below or you can click here to visit their website. – Telephonic consultation to determine which system is best suited for you. – Email a quotation to you based on the information received. – Site visit is scheduled if you accept the quotation in principle. – The final sales order is then sent to you. – Installation done bewteen 3-5 days once proof of the deposit is received. So, investing in a solar geyser would definitely be a wise choice , as this product offers one of the simplest solutions as a part of your overall energy saving strategy.